U.S. stocks slumped as investors considered what a tumble in oil prices means for the economy. The dollar extended a gain and gold dropped after a report showed producer prices rose more than forecast in October. Canadian stocks also edged trading lower. The S&P/TSX Composite Index was down 114.65 points to 15,242.82. Energy shares weighed on the S&P 500 Index as technology stocks underperformed the broader market. Europe’s main equity gauge dropped after disappointing forecasts from Richemont and Thyssenkrup AG. 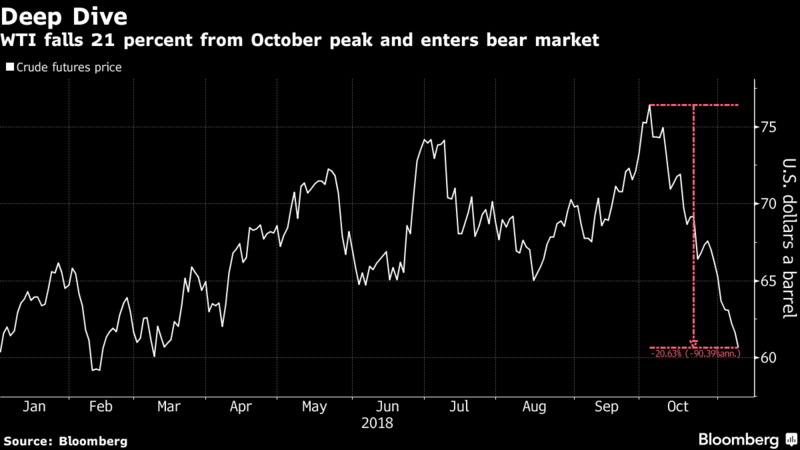 Oil headed for its longest losing streak on record after falling into a bear market. Treasury yields edged lower after the Federal Reserve on Thursday reiterated its plan for “further gradual” rate increases. The S&P 500 Index fell 0.5 per cent as of 9:32 a.m. in New York. The Stoxx Europe 600 Index dipped 0.4 per cent. The Nikkei-225 Stock Average declined 1.1 per cent. The MSCI Emerging Market Index sank 1.4 per cent. The Bloomberg Dollar Spot Index increased 0.1 per cent. The euro declined 0.1 per cent to US$1.1348. The British pound fell 0.3 per cent to US$1.3027. The Japanese yen rose 0.1 per cent to 113.94 per dolla. The yield on 10-year Treasuries declined one basis point to 3.22 per cent. Germany’s 10-year yield dipped three basis points to 0.43 per cent. Italy’s 10-year yields rose three basis points to 3.42 per cent. West Texas Intermediate crude dipped 1.8 per cent to US$59.57 a barrel, reaching the lowest in almost eight months on its 10th straight decline. Gold sank 1 per cent to US$1,211.59 an ounce, hitting the weakest in a month.